Correspondence about the Photofinish in each of your last two issues has prompted us to reply. For nearly 20 years we have been photofinish camera operators (both film based and digital) in the north. Our company (Northern Digital Photofinish Ltd) operates at almost all galloping, trotting and greyhound racetracks north of Taupo. As contractors to the Northern Racing codes, we process most of the strip finish photos seen in the Friday Flash and all of the New Zealand photofinish images seen on the internet. These images are low-resolution copies of the high-resolution images used by the judge. We reduce them in order to show more placegetters. How are the images formed? Unlike still, movie or video cameras, the photofinish camera has no shutter and there are no frames. The capture is continuous. In place of a shutter, the photofinish camera has a narrow line of sensors behind the lens, aligned on the finishline. Using a digital scan (up to 2000 times per second) the Finishlynx system continuously captures an image of the extremely narrow (approximately 5mm) strip of track, which is the finishline. In essence this is a photograph of time and whatever passes the finishline during capture becomes a part of that image. All parts (nose, tail, hooves, ears, saddle, jockey ? 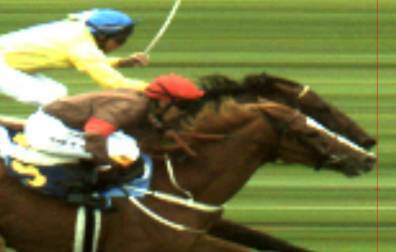 the lot) of all horses in the photofinish image are right on the line. JUDGES LOOK … the same photo as above but at a higher resolution for the judge. This was a dead heat. Your readers may have noticed that some horses have misshapen legs in some finish images. This is due to a horse putting it’s hoof on the ground right on the line. The hoof stays still as the horse passes over it. The hoof is captured for the entire time it is stationary on the line. Because the capture is continuous, the hoof appears elongated. Because the photofinish image is the finishline captured over a period of time, it doesn’t matter where the line is placed. As long as it is parallel with the finishline it is always on the line. It functions as a point of reference assisting the viewer to judge which finisher’s nose reached the line first (or third or eighth or whatever). In the Finishlynx system the line is created digitally and is always in line with finishline. It can be moved to assist in placing finishers, but it cannot be tilted or otherwise manipulated. The digital system is also used for race timing. Because it is a photo of time, it can have a start triggered automatically by the barrier gates or starter’s button. As the finish is captured, the time elapsed from the start is recorded. In this way a time is determined for each finisher and the margins calculated from these times. When a finisher’s time is taken from a beam broken by the finisher we can never be sure which part of the finisher broke the beam first. The Finishlynx time, on the other hand, is always taken on the finisher’s nose. The Finishlynx system prints and exports these results, which we supply as the official record of the finishing order and finisher’s times used by Racing Industry bodies, Clubs and the media. All of our finishes are available as glossy colour prints and may be ordered from Northern Digital Photofinish Ltd, Ph 09-846 1802.